UMass-Amherst has been a busy hive of research into the thermochemical production of biomass-derived fuels and chemicals. 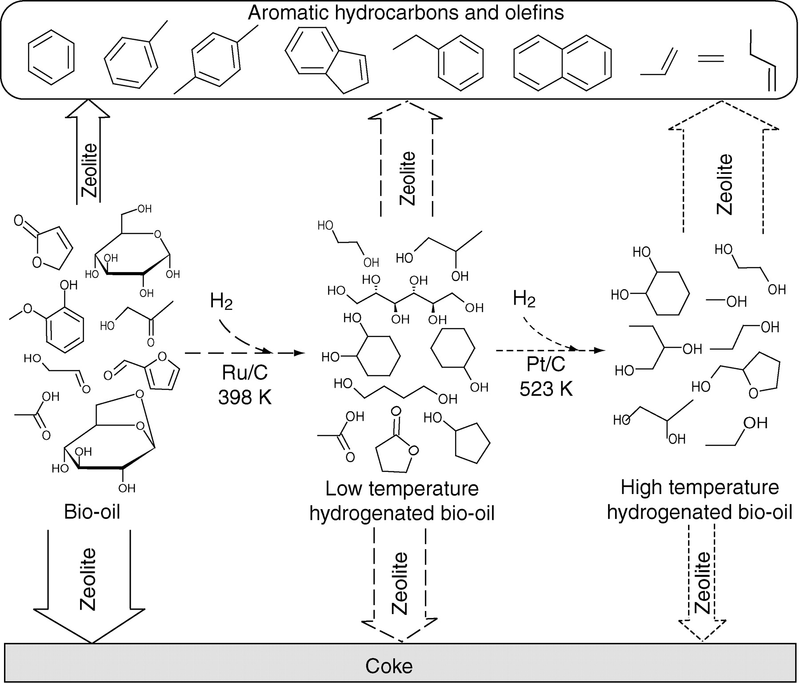 Here is a report on a "tuneable", high-yield approach to the production of bio-hydrocarbons -- including high value fuel additives and other possible high value chemicals. In the new UMass approach, the hydroprocessing increases the intrinsic hydrogen content of the pyrolysis oil, producing polyols and alcohols. The zeolite catalyst then converts these hydrogenated products into light olefins and aromatic hydrocarbons in a yield as much as three times higher than that produced with the pure pyrolysis oil. The yield of aromatic hydrocarbons and light olefins from the biomass conversion over zeolite is proportional to the intrinsic amount of hydrogen added to the biomass feedstock during hydroprocessing. The total product yield can be adjusted depending on market values of the chemical feedstocks and the relative prices of the hydrogen and biomass, the researchers said. The integrated catalytic approach presented in this report can be tuned to produce different targeted distributions of organic small molecules that fit seamlessly into the existing petrochemical infrastructure. The products can be tuned to change with different market conditions. The C6 to C8 aromatic hydrocarbons can be high-octane gasoline additives or feedstocks for the chemical and polymer industries. The C2 to C4 olefins can also be used directly for polymer synthesis or can be modified to form other products, including alkylated aromatics and longer linear alpha olefins. The gasoline-range alcohols can be high-octane gasoline additives. The C2 to C6 diols can serve as feedstocks for the chemical and polymer industries. The chemical industry relies on seven primary building blocks that are all derived from petroleum-based processes: benzene, toluene, xylene, ethylene, propylene, 1,3-butadiene, and methanol. Our catalytic process produces five of these seven petrochemical feedstocks, which opens the door to a chemical industry based on renewable biomass feedstock. Anellotech is one startup spun off from UMass Amherst, to produce catalytic pyrolysis fuels. There should be many others, as the chemical engineering program releases new batches of well trained and ambitious chemical engineers every year. Pyrolysis, gasification, and other thermochemical approaches to advanced biofuels and chemicals are likely to surpass fermentation fuels such as maize ethanol. But the ethanol industry is not standing still, it is developing ways to reduce energy requirements and finding ways to expand its feedstocks to include cheaper biomass. Butanol -- a superior biofuel -- can be fermented from the same feedstocks as ethanol, once researchers develop better microbes -- so don't count out fermentation just yet. But the thermochemical approaches championed by UMass-Amherst have a big advantage. They are quick, easily scaled, and can provide a broad range of fuels, fuel additives, high value chemicals, soil additives, fertilisers, and animal feeds. They are expensive, of course, and will require high oil prices to make them profitable. But let's be brutally honest. Humans do not actually need these biomass to fuels approaches right now -- and won't need them for a few decades yet. But it is better to develop the technologies and have them available for when they are needed, if you can. There are plenty of reserves of coal, gas, crude oil, and other hydrocarbons to see us through a long time yet -- in a very clean and environmentally responsible manner. But carbon hysterics rule the land at this time, and what is worse, these carbon hysterics are also dragging their feet in approving new nuclear technologies. So that leaves us with only hydro, geothermal, and biomass / biofuels to oppose the energy starvationists and their suicidal wind / solar agendas. As long as carbon hysterics, energy starvationists, anti-nukes, and dieoff.orgiasts control the governments and inter-governmental institutions, we had best go as fast as we can in developing fuels and energy from biomass.